I told an old flame that I was getting married and his response was “darn…I’m too late!” My response, to myself of course was, “If you like(ed) it then you shoulda put a ring on it. Don’t be mad once you see that he want it.” In this song – the ring is not literal, but a symbolic act of commitment. Although the ring is intended to serve as a symbol for the union between two people, the ring has become an overrated importance for engagements/weddings in my opinion. Inquiring minds cannot stop asking me about my engagement ring. I also cannot seem to dodge the obvious and awkward stares at my ring finger. I’ll cut straight to the chase for those who have not been privy to seeing me in person and hopefully avoid all future questions and glances at my ring finger. I do not have a diamond engagement ring. After I accepted my fiance’s proposal, I told him there were a few things missing that we normally do in America. As I wrote in a previous post, I told him he needed to speak with my family AND I told him I needed a ring. At the time, we were in his village. He couldn’t exactly run to the mall to pick up something. Furthermore, he simply didn’t have the money. It’s true when they say necessity is the mother of all invention. The next day, JB came to me with two rings from his mother. I picked the one I liked the most and from that day on I have been wearing his mother’s band on my ring finger. Now, I am not into jewelry at all – its hard to be into jewelry when I lose or break about 75% of all jewelry I touch. But what girl wouldn’t want a nice diamond ring on her finger? Kobe’s wife Vanessa certainly rethought her marriage after Kobe purchased a rare, 8-carat purple diamond ring as an apology for his sexual assault case in 2003. But being engaged has really allowed me to see people’s twisted perception of marriage firsthand. More emphasis is being placed on an object and the ritual rather than the connection between the two people or who the man is I am intending to marry. I have many male friends who have delayed putting off asking their lady to marry them because they haven’t been able to afford a ring. I say, if she really loves you ask her to marry you and the ring will come later. I know many females will not agree with me, but with the divorce rate at 50% in the United States, I think it is time we rethink our priorities with regards to marriage. My ring (although some sort of upgrade will be taking place in the future) is truly symbolic as it is handed down from his mother. It symbolizes a connection not only between he and I, but also between his family and myself. Additionally, it is representative of his willingness to accommodate some aspects of my culture as traditionally a ring would not be given at engagement, but during the marriage ceremony. I will add: We did look at some rings at various shops in Morocco and most of them were gold. I loathe gold as much as I loathe mayonnaise on a hot sandwich. So for now, I will pass on the traditional Moroccan wedding ring and find something that suits me. Since I am a burgeoning tree hugger (in my head), I started exploring various types of somewhat affordable, personalized, eco-friendly, and conflict free jewelry. My search has just begun, but here are two companies that are currently saved to my favorites. 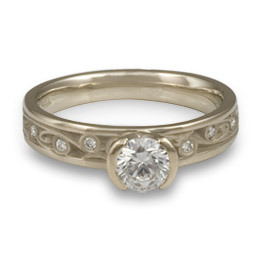 Artisan Wedding Rings and Brilliant Earth. Artisan sells rings that are (according to its website) made from renewed (recycled) or fair trade metals. Brilliant Earth specialized in conflict free and organic jewelry. With Brilliant Earth you can build your own ring. Here are two of my favorites. These are not the most affordable offerings from either of the companies, but they do have many options with lower price points. Please send me pictures of your unique wedding rings or jewelry stores that specialize in tree-hugging jewelery. The ring for me has always been a way to pubically declare that I am off the market. Further, that a man is really serious about committing to me, so much so, he has spent money on it. However, a loving relationship, a house, savings, all matter far more than the ring. obviously. If my boo couldn’t afford a diamond but showed initiative like your man did, who cares. However, the western/consumer in me can’t help but wonder if no ring signals a life with less material security? People will always impose their ideas about love onto other’s even when it ain’t working for them. You’ve snagged yourself a keeper right? Something we all aspire to. Who cares. 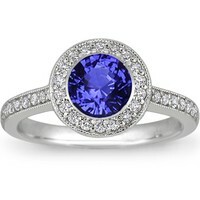 I do agree a ring of some type is important because it is an immediate sign to the public that you are off the market! I do think we often get caught up in the hype and rituals around getting married. I don’t think the rituals are bad but I think it is important not to have the rituals including the ring be more important than the person. For me I want a ring when I get engaged. The ring is the symbol of the commitment and my accepting the ring is a sign of my agreeing to the marriage. But very similar to what you write here the ring does not need to be more than is affordable and a family ring would have a lot of meaning.